10 blog posts per month – I have a 6 post deficit for February, so now I am 8 posts behind. 10 crafts – 0 crafts this month, 10 to go. 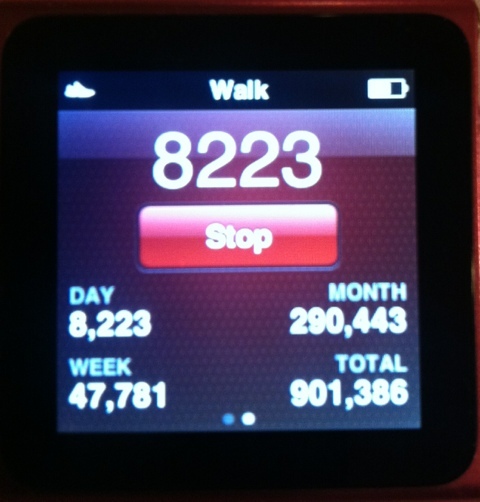 Last month I did a little something different, where I wore a pedometer every day and I tried to get 10,000 steps a day. As you can maybe see from my blurry picture, I managed 290,443 for the month, so I did make it to my goal! Two things I learned about myself: I barely move on Sundays, and I get a lot more exercise when I work from the office than from home. Also, I do not like to fail at my goals so I definitely started to skimp on strength training in order to get all my steps in. I need a new workout goal for March because, “Oh no! I have to be lounging in a hot tub in a bathing suit for spring break” has so far gotten me nowhere. Possibly because the thought just occurred to me a few seconds ago. This entry was posted in food, pie, resolutions on March 3, 2012 by metamegan.